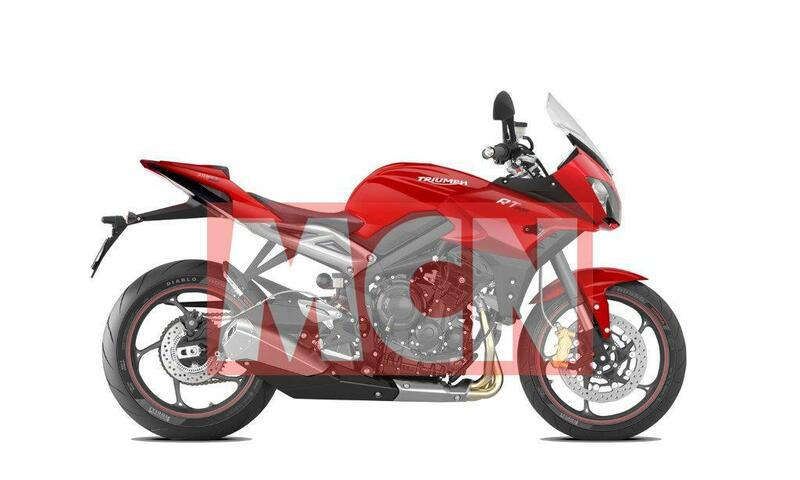 It was approaching a year ago when we revealed Triumph’s plans to boost the Street Triple range with a larger engine and more models, and now we’ve finally got the first pictures of one of the new bikes on test. 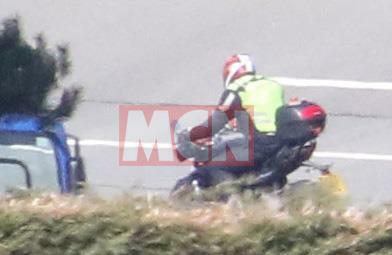 It’s taken months of work by MCN’s spy photographers to finally get the photographic evidence to back-up the rumours and insider tip-offs, and now we can bring you the most complete and up-to-date picture of the changes we expect to see for one of Britain’s most popular motorcycles. While at a glance the bike could be mistaken for a Speed Triple, or even a current-model Street Triple, closer inspection reveals that it doesn’t resemble either machine. The front end is very redolent of the new 2016 Speed Triple, in particular thanks to the mirrors that are mounted on the bar end weights rather than on stalks from further inboard. There are also Speed Triple-style metal panels on the sides of the radiator. 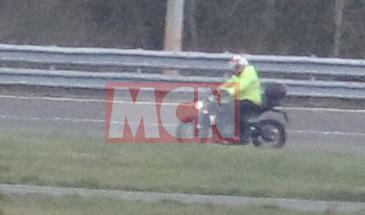 However, the rear half of the bike doesn’t match the Speed Triple at all. 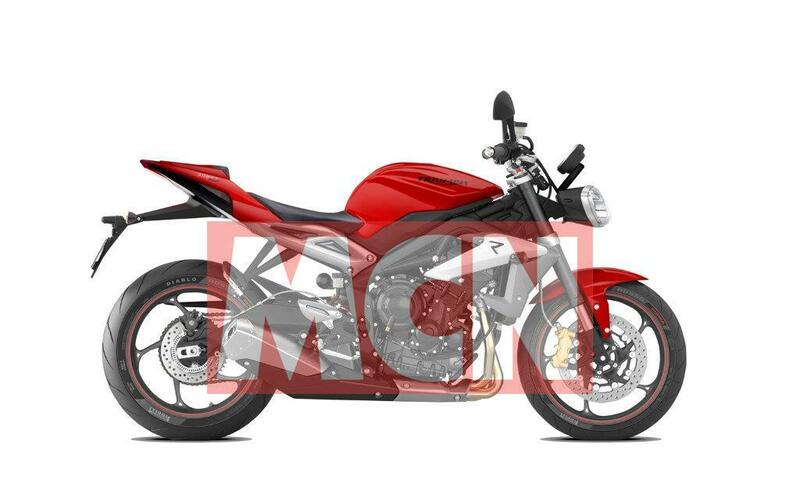 The lack of high-level exhaust cans give the rear end clearly mark this out as a Street Triple, and the swingarm is a double-sided design which further underlines the differences between this prototype and their flagship naked roadster. The shapes of engine cases also match the smaller three-cylinder engine rather than the 1050cc unit. Everything points at this bike being the new Street Triple; a bike which Triumph need to push through to production as fast as possible to ensure they suffer no dip in sales performance as a result of the Street Triple not being able to meet stringent new Euro4 regulations. And that means it’s a machine with huge mechanical changes compared to the existing model, explaining why Triumph’s riders are pounding around a closed test track on the prototype. Triumph were asked to a comment on the spy shots, and the existence of the new bike, but the firm declined to comment, in line with their usual policy of not discussing upcoming new models. A survey sent out by Triumph to potential buyers last year revealed a huge level of detail around the proposed changes planned for the Street Triple, with the headline update being a capacity boost to more than 750cc. While Triumph already make a 799cc triple for their Tiger 800, that is a long-stroke motor aimed at providing plenty of low-down torque, rather than a short-stroke motor that’s capable of higher revs and stronger peak performance. The Street Triple’s new engine is likely to be a similar capacity but via a bigger bore and shorter stroke. We understand the engine is going to be a 765cc as Triumph has been inviting owners to focus groups to discuss the new range of bikes. Unlike the current range, where the Street Triple, Street Triple R and Street Triple RX all use the same engine spec, the new line-up will have three power levels. Even in base trim the new engine is projected to make 110bhp – up from 106bhp for the current 675cc motor despite carrying the emissions-reduction equipment needed to meet 2017’s Euro4 restrictions. The 2017 Street Triple R will make 125bhp as well as gaining radial Nissin brakes and adjustable Showa suspension instead of the entry-level non-adjustable Kayaba kit. The RX model is set to be dropped and instead the new range will get two higher-spec bikes, both using a 125bhp version of the engine. 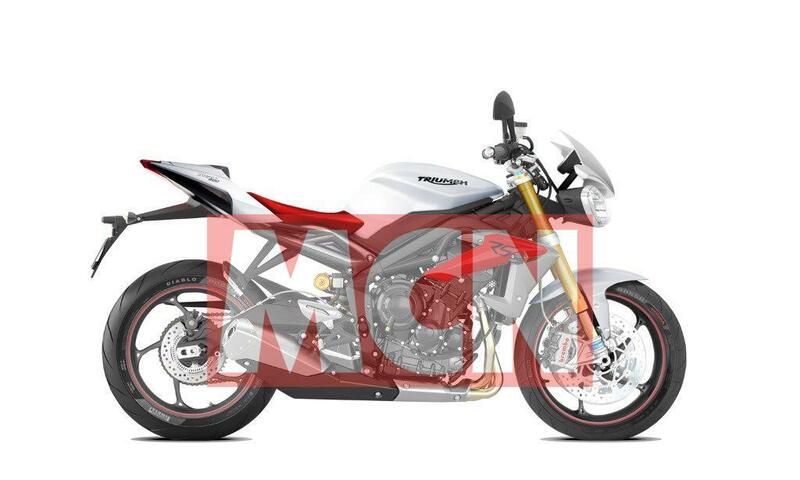 The Street Triple RT will be a sports-tourer, with ‘R’ spec Showa suspension and brakes plus a screen, a bellypan, a tyre pressure monitoring system and the option of a half-fairing. Meanwhile the range will be topped by a new RS model using Öhlins suspension and Brembo brakes, just like the Speed Triple R.
All models will get switchable traction control as well as the ABS that is now mandatory on new bikes. On top of that, the R and RS will have three switchable riding modes, while the RS will have five modes and more advanced stability control that senses lean angles as well as rear wheel slip. The top three models will also get a high-definition TFT instrument screen – something we spied being tested on an otherwise-stock Street Triple last year. Last year’s survey suggested a starting price of £7790 for the base Street Triple, £8790 for the ‘R’, £9790 for the ‘RT’ and £10,190 for the ‘RS’ – the prices are highly likely to change in line with inflation by the time the bikes reach showrooms in 2017, but they show the likely spread of the new range. The larger Speed Triple – just refreshed for 2016 and gaining much of the same technology that will be going on to the new Street Triple – currently starts at £10,200, rising to £11,500 for the R version.